The school is located on Isla Colon, Bocas' main island, close to everything: restaurants, bars, hotels and just a short walk or boat ride to loads of beaches and surf breaks. The school is situated in a quiet street, just a 5-minute walk from the center of Bocas Town. It is a beautiful building with a gallery with seating on the first Floor. There are 12 classrooms, a kitchen, a garden and a lounge. The school offers an extensive programme of activities and excursions. Every day there are 2 or 3 activities and a field trip on the weekend. Activities include yoga, salsa and surf lessons, beach volleyball, cycling and jointly meals. In this course you will learn Spanish very intensively in small groups up to 6 people. You have 20 lessons per week. Before arrival, you will participate in a placement test via Internet. Yet your oral skills will be tested on-site and you will be assigned to the group with the corresponding level. Beginners always will attend a beginners group. Laundry at an host family is possible for a supplement of € 5 per person per week. Please note: during some dates there are extra surcharges (espacially during national holidays). Please contact StudyTravel for the extra charges. Holy Week (April 15th until April 21st). Please always contact StudyTravel to confirm the final price. The price mentioned is for an airport transfer up on arrival at the Airport of Bocas Town. This transfer is inclusive when accommodation is booked with a host family. With arrival before 8 am and after 5:30 pm a supplement of € 10 is charged. If you travel via Panama City: 1 night at a hotel in Panama City = € 70 p.p. Transfer up on arrival at Panama City to hotel: € 42 p.p. Transfer from Panama City to Bocas del Toro can be arranged, contact us for more information and prices. In 2019 the school is closed on 01/01/2019, 09/01/2019, 04/03/2019, 05/03/2019, 19/04/2019, 01/05/2019, 03/11/2019, 04/11/2019, 05/11/2019, 28/11/2019, 08/12/2019, 25/12/2019. Missed lessons during these days will usually be rescheduled on Saturday Morning. The mini-group course of 20 lessons per week is supplemented by 1 hour private lesson per day. These private lessons are designed according to your personal wishes: from everyday conversations to professional usage. Flexibility is the large advantage of private lessons! Individual tuition is designed to meet your personal interests and needs (Business Spanish, Medical Spanish ...), as well as your individual language level. This guarantees a perfect learning environment! Living with a host family is a perfect opportunity to get to know the everyday life in Panama. You will stay in a single room with the options of no meals, breakfast or half board (breakfast and dinner). All host families live within a maximum of 20 walking minutes from the language school. Considering the international atmosphere in Bocas del Toro, the accommodation in a host family is a fantastic opportunity to practice your Spanish in real-life situations. In this hostel (Guesthouse 421) you will stay with other (mostly young) tourists. It is a very popular place for backpackers, but also students stay here regularly. 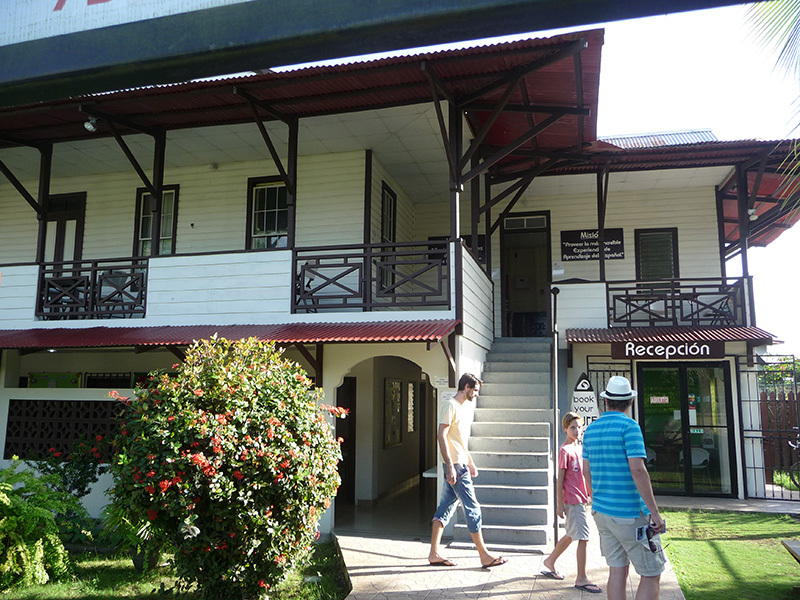 The hostel is located in a typical Caribbean mansion, made of wood, where you will easily feel at home. There are spacious rooms and common areas with balcony, so you definitely not feel that you're in a hostel, but more in an "upscale" budget accommodation, with all the necessary facilities such as Wi-Fi, Air-conditioning and hot water. The distance to the school is only 2 minutes walking. When you book a double room, you'll stay in a dormitory with 5 other beds and a shared bathroom. When you book the single room, you'll stay in a suite with your own private bathroom, hot water, and you’ll be able to enjoy a comfortable king size bed. During your stay, you can cook your own meals in the shared kitchen. The shared kitchen has a stove, a refrigerator and dining area. If your privacy is very important to you, you can chose an apartment / studio. The kitchen, bathroom, etc. then of course you do not have to share with anyone. Meals are not included. These private studios (the Bocas del Toro Island Condos) are located in the centre of the town, at only 10 minutes walking from the school. You’ll stay in a modern complex with a clean and tropical design. Choosing this accommodation means you’ll enjoy a peaceful and air conditioned environment, at short distance to the school. Nearby you’ll also find the best restaurants and dance clubs.